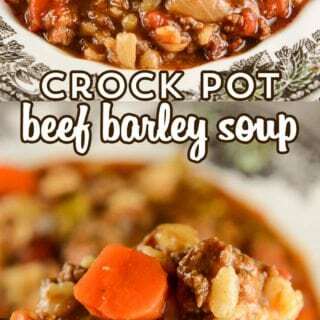 Crock Pot Beef Barley Soup - Recipes That Crock! Crock Pot Beef Barley Soup is a classic slow cooker soup recipe that is so easy to make and always a family favorite. Cris here. 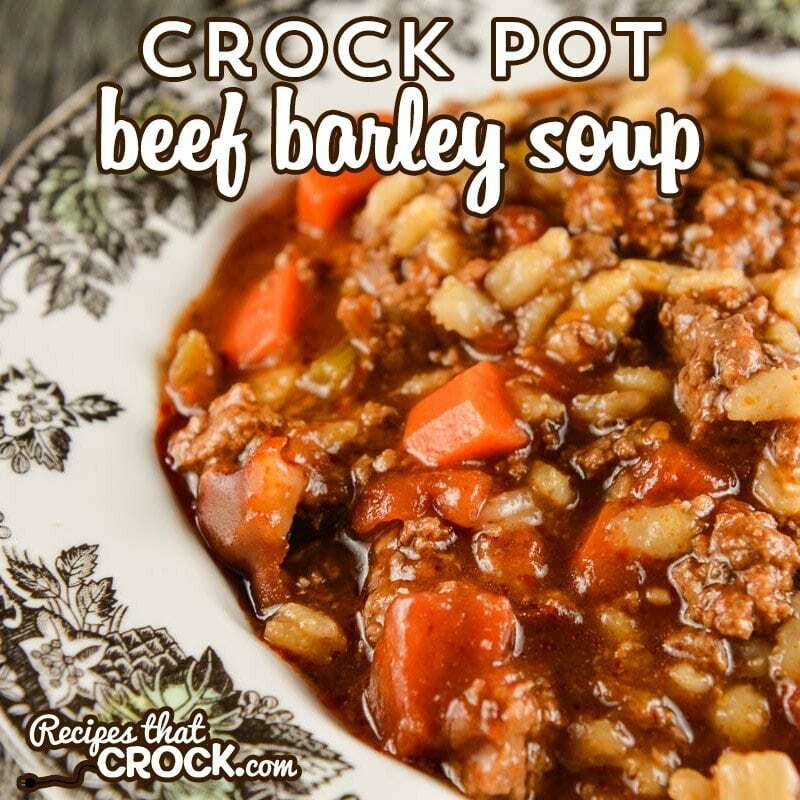 This Crock Pot Beef Barley Soup is a slow cooker adaptation of the popular soup from Gooseberry Patch’s Fresh & Easy Family Meals. The beefy hearty flavor makes for a perfect lunch or dinner. My favorite part? The delicious slices of carrots! I just love cooked carrots. This soup is easy to throw into a slow cooker and cook all day. I like using our browning slow cookers to cook this up because I can brown the ground beef with the onion and celery in the unit and then flip it to slow cooker without having an additional skillet to wash. However, you can use a skillet to brown your meat and then pour into any 6 qt slow cooker if you would like. You can switch up the flavor of this dish a bit by switching out the diced tomatoes with your favorite flavored diced tomatoes. Basil, Oregano and Garlic varieties are some of my favorite to switch out. 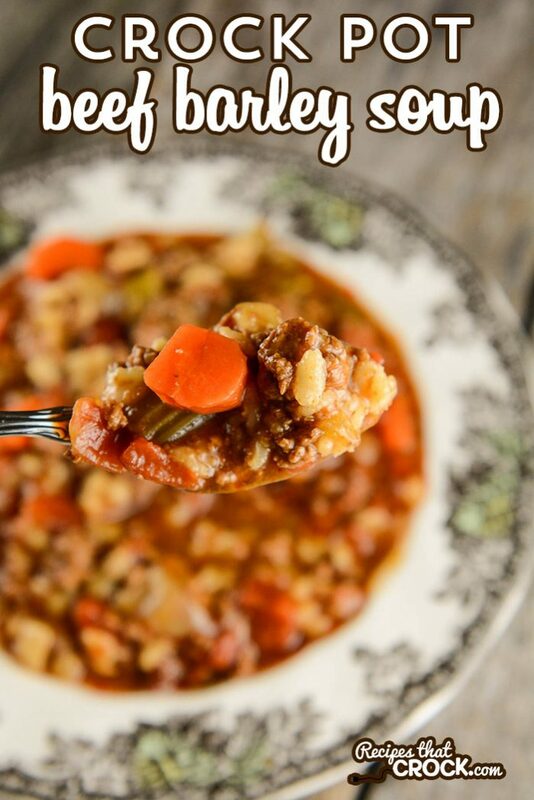 This Crock Pot Beef Barley Soup is super easy and delicious! Is there any need to cook the carrots too when you are cooking the meat, onion and celery on the stove first or will the carrots be fine cooked just in the crock pot? I really want to try this recipe, sounds better than the one I’ve been using for years. Hi Barbara! The carrots will cook up just fine without precooking. Enjoy! I love that idea! I am going to have to try it! I love this soup. I basically make it the same way except I use cubed roast beef. It is so good. Thanks for sharing your version, I will have to try it. Do you use chicken stock or beef stock in addition to the beef consommé? Yep! If you would like to reduce the sodium in the recipe, you could always use water instead of the broth. Enjoy! Looks yummy! Will try this recipe over the weekend. If I cut the ingredients of the recipe in half to serve only 5-6 people, do I need to reduce the cook time to 4 hours or keep it at 8 hours? I would say that depends on your slow cooker size. If the recipe fills your slow cooker up at least 2/3 full (ideally) then your cooking time will most likely be the same. However, if you are still using a larger slow cooker with less ingredients then you will need to reduce your cooking time likely. In that case, I would just watch it from about the 4 hour mark on. Enjoy!